Ernest Callenbach (April 3, 1929 – April 16, 2012) was an American author, film critic, editor, and simple living adherent. He became famous due to his internationally successful semi-utopian novel Ecotopia (1975). Born into a farming family in Williamsport, Pennsylvania, Callenbach attended the University of Chicago, where he was drawn into the then 'new wave' of serious attention to film as an art form. After six months in Paris at the Sorbonne, watching four films a day, he returned to Chicago and earned a Master’s degree in English and Communications. Callenbach then moved to California. 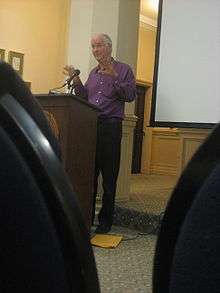 From 1955 to 1991, he was on the staff of the University of California Press (Berkeley). A general copywriter for a number of years, he edited the Press's Film Quarterly from 1958 until 1991. He also occasionally taught film courses at U.C. and at San Francisco State University. For many years Callenbach edited the Natural History Guides at the U.C. Press. He began to take environmental issues and their connections to human value systems, social patterns, and lifestyles just as seriously as he had taken film. He was heavily influenced by Edward Abbey. Callenbach talked publicly about being influenced, during work on his novel Ecotopia, by numerous streams of thought: The scientific discoveries in the fields of ecology and conservation biology. The urban-ecology planning movement, concerned with an approach to urban planning. The soft-energy movement, championed by Amory Lovins and others. In terms of concepts of human involvement with the ecology, as well as some of the economic and social concepts, the Ecotopia books are related to what is known as the sustainability movement. Callenbach’s Ecotopian concept is not "Luddite" — he does not reject high technology, but rather his fictional society shows a conscious selectivity about technology. As an example, with its emphasis on personal rather than impersonal interaction, Callenbach’s Ecotopian society anticipates the development and liberal usage of videoconferencing. Indeed, for all his involvement with print publishing, Callenbach remained quite interested in visual media. Aspects of his book Ecotopia in some ways anticipated C-SPAN — which came into being a few years later — because in the story the daily life of the legislature and some of that of the judicial courts is televised in this fictional society, and televised debates (including technical debates concerning ecological problems) meet a need and desire among citizens. Callenbach was a part of the circle of West Coast technologists, architects, social thinkers, and scientists which included Ursula K. Le Guin, Sim Van der Ryn, Peter Calthorpe, Stewart Brand, Kevin Kelly, J. Baldwin, and John Todd. As with some of these others, he was often a speaker, discussion panellist, and essayist. In 2006 Callenbach introduced the story of a real-world community movement in Japan that is reminiscent, in its aims and practices, of his Ecotopian society. He visited Japan and investigated the Yamagishi movement. He found that it encompassed some three dozen intentional communities founded on the same underlying principles: living an ecologically based integration of people with agriculture (pig, cattle, and chicken livestock rasing, and organic-vegetable and fruit farming), and living a social life based on principles of democracy, mutual understanding, support, and health. Each individual settlement is referred to as jikkenji (‘demonstration community for the world’). In 2009, Callenbach was awarded an honorary doctorate by the University of Freiburg. Freiburg is noted for its renewable energy industry and has been called a "green utopia". Ernest Callenbach "Ecotopia in Japan?," in: Communities 132 (Fall 2006), pp. 42–49. R. Frye, "The Economics of Ecotopia," in: Alternative Futures 3 (1980), pp. 71–81. K.T. Goldbach, "Utopian Music: Music History of the Future in Novels by Bellamy, Callenbach and Huxley," in: Utopia Matters. Theory, Politics, Literature and the Arts, ed. F. Viera, M. Freitas, Porto 2005, pp. 237–243. U. Meyer: "Selling an 'ecological religion'. Strategies of Persuasion in Ernest Callenbach's Ecotopia". In: M. Lotz, M. van der Minde, D. Weidmann (Hrsg. ): Von Platon bis zur Global Governance. Entwürfe für menschliches Zusammenleben. Marburg 2010, pp. 253–280. H. Tschachler, "Despotic Reason in Arcadia. Ernest Callenbach's Ecological Utopias," Science Fiction Studies 11 (1984), pp. 304–317. ↑ Woo, Elaine (April 25, 2012). "Ernest Callenbach obituary: Author of novel 'Ecotopia' dies at 83". latimes.com. Retrieved 2012-04-25. 1 2 Callenbach, Ernest. ""Life in a Desirable Future," a talk at the Rubenstein School for Environment & Natural Resources at the University of Vermont". Retrieved 2013-04-05. ↑ Kirk, Andrew G. (2007). Counterculture Green: the Whole Earth Catalog and American Environmentalism. University Press of Kansas. ISBN 978-0-7006-1545-2. ↑ Callenbach, Ernest (2006). Ecotopia in Japan?, in: Communities 132, Fall 2006; Rutledge, Missouri; pp. 42–49. ↑ "Ehrenpromotion Callenbach – Englisches Seminar". University of Freiburg. Retrieved 2011-10-28. ↑ Watson, Nick (June 13, 2008). "Vauban – a green utopia?". BBC News. Retrieved 2011-10-28.